My synthpop band Eurotix just released our debut EP "I Plead Insanity"! It was the first song we recorded together, so it holds a special place in our hearts. The EP also includes a remix of the title track, an Army Of Lovers cover and the exclusive B-side "Replay". Stefan Gemzell has directed a moody photo video for the song, available on YouTube. The single is out now on iTunes, Spotify, Amazon UK, Amazon US, Amazon DE, CDON and many other digital music stores. 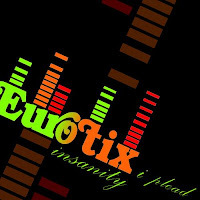 For the latest news on Eurotix and the upcoming album, keep checking the official Facebook page. Credits: Tracks 1, 2 and 4 written by Larry Forsberg, Sven-Inge Sjöberg, Lennart Wastesson. Track 3 written by Alexander Bard, Magnus Frykberg, Emil Hellman, Leif Jacobsson. Track 2 remixed by A Blue Ocean Dream. Produced by Eurotix. Distribution: Computer Killed The Recordstore. Logo: Andreas Pernlund. Artwork: Jeffrey Trull. You have to check out this heartwarming video where kids react to gay marriage. I think the world would be a much better place if grown-ups were as open-minded as children. "Justin Bieber married a guy!"